The Bethesda-to-New Carrollton rail line hit a milestone Thursday as crews broke down the last barrier between a short section of tunnel and the site of a future station in Silver Spring, Maryland. See video. A breakthrough has come for the Purple Line project — literally. 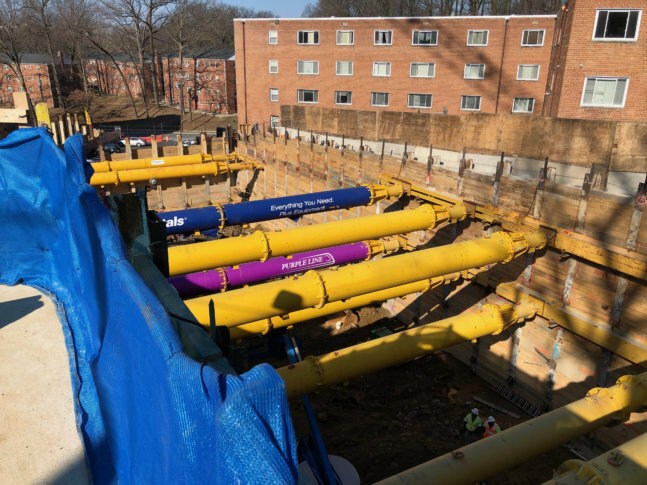 The Bethesda-to-New Carrollton rail line hit a milestone Thursday as crews broke down the last barrier between a short section of tunnel and the site of a future station in Silver Spring, Maryland. The breakthrough came after a huge hammering machine took down concrete support columns that had been in place during the tunnel’s construction. The 1,000-foot tunnel, running from Arliss Street to Wayne Avenue, was needed because a hill in the area was too steep for trains to climb. The excavation, which at times required explosives, took eight and a half months, and ended ahead of schedule, according to project manager Jean-Marc Wehrli. The Silver Spring site, along with Bethesda, is one of two underground areas along the Purple Line route. Blasting is ongoing at the Bethesda site, and excavation there will continue for two years, Wehrli said. The Washington Post reported that the project’s contractor believes the rail line could open in 2023 at the earliest. Construction of the line started a year behind schedule because of a lawsuit. The contractor had also said environmental reviews and property acquisitions were among the issues that had slowed progress.